An Associated Press article explains the proposal for Texas public schools to remove a mention of Christmas in the sixth-grade social studies plan and replace it with a Hindu religious festival. The draft proposal being considered by the State Board of Education won't be formally adopted until next May for the 2011-2012 school year. The standards will remain in place for the next decade, dictating what is taught in government, history and other social studies classes in elementary and secondary schools. The standards also will be used to develop state tests and by textbook publishers who develop material for the nation based on their largest market, Texas. The standards currently instruct sixth-grade students to be able to explain the significance of religious holidays such as the Christian holidays of Christmas and Easter, the Muslim holy month of Ramadan, and the Jewish holidays of Yom Kippur and Rosh Hashanah. 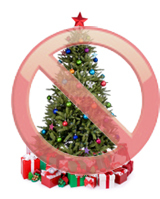 The proposal, which is set to be debated during a hearing next week, removes the words Christmas and Rosh Hashanah. Diwali, a Hindu festival, is added. America is not equally divided among these five religions. Mentioning Christmas and Rosh Hashanah does not promote either Christianity or Judaism; rather, it simply acknowledges with accuracy the religious culture of America as it actually exists that these holidays have been awarded their place in the culture by the people themselves. This is just another ridiculous attack on Christmas from the far left fringe of society. I will be voting against this recommendation by the writing panels, and I will insist on a record vote so that constituents will know which way their SBOE member voted on this. While your blog is appreciated, could you also include WHO is making this decision. HOW do we contact them. This is BS and they need to hear from US. We have not voted on the standards yet, so this decision has not been made. It is a proposed change that has been made to the SBOE by the TEA review panels. The proposal is in the first curriculum draft of standards. You can email the full board at sboesupport@tea.state.tx.us.